How difficult/safe is Hartley’s helmet diving? 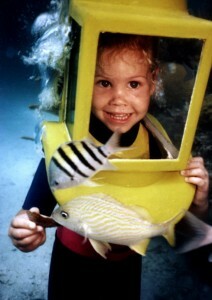 Daughter Sandy, now 25, diving at age 3 1/2. No swimming skill necessary. One need only be able to walk and breathe (Yes, simultaneously!). Divers breathe normally and are not forced, as in snorkeling, or scuba diving, to breathe through their mouths only. The Hartley diving helmet keeps your head dry, and clearing of ears is easier. You navigate and perceive in the normal upright position, rather than the unfamiliar one of a bird, flying around looking down. During the 25 minute briefing to the reef you will learn the who, what, where, when and why of your experience. There are two back-up air delivery systems. One uses compressed air, the other is 12 volt. There is enough air in the diving helmet to walk back to the boat, with no fresh air being pumped in. Eighty percent of the dive is done within 12 feet of the ladder. As we are in only 8-12 feet of water there is always the option (not recommended) of ditching your helmet and swimming the six or so feet to the top. IMPORTANT: To prevent lung rupture you would not impulsively hold your breath, but rather calmly, let air bubble out as you ascend, for the 2 or 3 seconds it takes to get to the surface. The back of the boat is cut out so you simply step 9 inches down onto the large platform. The custom built ladder is wide and the top rungs are flat and padded. It nears the bottom at low tide. This is a guided tour; you are not permitted to wander freely. Still, you would not be able to get lost as you can follow your hose back to the boat. You can come up at any time. Much of the time (when not holding fish or taking photos), divers are holding on to the ‘grab-bar’. This is a 7 foot pvc pipe. It keeps all divers in a close group so they can see all the marine life I am identifying, and allows me to see into every diving helmet to see a smiling acknowledging expression. Although your sense of direction is challenged in a new environment, and you think we have walked a long way, we are never more than 50 feet from the boat. Most of the dive time is very close to the boat.We purposely have divers facing the reef and away from the ladder. The reef is the focus of our desire and having your back to the ladder increases the perception of being off on a bold adventure. The normal, pre-dive feeling of apprehension and anxiety evaporates when your feet touch the bottom. When you see for yourself it is as easy as described, that wound up feeling switches polarity from scared and nervous, to exciting and fun.